Chicago native Glenn Horiuchi seems to have been destined for a life of music, as he grew up singing and hearing Japanese folk songs. His grandfather, Saburo Sugita, who not only was one of the first Japanese-Americans to be heard playing music on the radio (he was known for his Shakuhachi or Japanese flute playing), he also composed a song about life in the US concentration camps during World War II. It was this weaving of music and politics which would color almost all of his compositions. It seemed that he didn't do much of anything in moderation.At times he was an auto mechanic, a graduate student of mathematics, construction worker, multi-instrumentalist (guitar, piano and Shamisen) and a music teacher. Later in his life, he studied Zen. Near the end of his life, he said that he asked himself why he had to go full bore at everything he did. I found evidence of this when we got into a small argument about the history of Jazz; this argument would have been insignificant had he not been in the last months of his life, resting from his last concert! It was his dogged determination as a political activist that he made his greatest impression. The concentration camps of Germany are notorious and well known, however, it was only in recent memory that the camps in the United States were discussed on a national level. 1976 saw the release of the television film, "Farewell to Manazanar", which was written by a survivor. There were ten concentration camps in the United States, which interred some 110,000 Japanese-Americans. Horiuchi remembered this injustice on the Issei, which is the first generation Japanese-Americans (JA) and he helped to organize the Commission on Wartime Relocation and Internment of Civilians, which eventually led to the Redress and Reparations Act. In 1987, Horiuchi met Edna Ikeda, who was the love of his life. She is a teacher, activist and photographer who was credited on every album that he made, whether it be in the dedication or for her outstanding photography. They were married and settled in San Diego. They continued their activism and Horiuchi became more deeply involved with his music. He had played Rock guitar before, but he concentrated on piano and Jazz, infusing his work with Japanese song and rhythms and abstract touches. San Diego, not known for it's receptive and diverse musical atmosphere made it hard for him to find gigs, although there were grants that allowed him to complete his septet work, "Poston Sonata," after the concentration camp in Arizona. Horiuchi's first group consisted of M'Chaka Uba, a bassist who was one of the founding members of the Association for the Advancement of Creative Music, which was responsible for the birth of the acclaimed Art Ensemble of Chicago and drummer Leon Alexander. Alternating with Taiji Miygawa on bass, they recorded Horiuchi's first five albums on Jon Jang's AsianImprov records. He eventually moved to Los Angeles, which provided more venues for his work to be heard and he formed a quartet, Francis Wong, tenor sax, Anders Swanson, bass and Jeanette Wrate on drums. His musical palette, already a colorful one, grew even larger and his compositions more ambitious, incorporating large ensembles. One of the most important developments in his musical life was his taking up the Shamisen (a three-stringed Japanese instrument that looks like a banjo), which brought even more of his heritage to his music, as well as his studies of Nagauta and Zen. 1999 was the year that he was diagnosed with colon cancer. He had been rather prolific, but a cough that wouldn't go away had been misdiagnosed, so it had spread beyond the operable stage when he underwent treatment. 2000 saw his last concert, organized by his wife and friends where he played wonderfully (see review below). He eventually went off chemotherapy, since he rationalized that the chemicals were not making him feel better and he knew his condition was worsening. 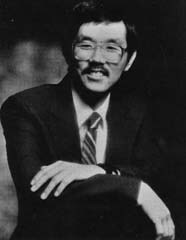 Glenn Horiuchi passed away at home on June 3, 2000. He is survived by his wife and son. His work both musical and political will live well into the future. First having met Horiuchi in a political context, I found it to be a pleasant surprise that he was a musician. The other, far more pleasant surprise was that was as deeply committed as he was to his politics, his musical talent seemed to match it. There are many cases in which politics and music are blended and one tends to suffer as a result. Reading Next Step's liner notes, there is no mistaking where he stood in his worldview; his first album is dedicated to the Redress/Reparations movement for the Issei. Had one heard the music without reading the liner notes, you would have heard an album of fine Jazz and Avant-Garde music. The first song, "In Movement" is a good barometer of almost all of his recordings. It incorporates the influences in his music rather nicely, going from Jazz and dipping it's toe in the abstract and the title refers to the JA experience in Los Angeles as well as the hearings of the Commission of Wartime Relocation and Internment of Civilians. Next Step features him for the first and last time almost in an almost solely Jazz context. He recalls Cecil Taylor and Don Pullen at times, yet on one piece, "Dreamwaters", featuring Ayanna Hobson, he accompanies her without dominating or fading into the background. The title track finds him at his most abstract, much like the protagonist in Arnold Schoenberg's "Transformation", he seems to "feel the air of another planet," one that will take him on a path that would become unique to him. This is rather dense and textured music from trios (M'Chaka Uba and Taiji Miyagawa on bass and Leon Alexander on drums). His second album, Issei Spirit is very much in keeping with the first album, but it in no way prepares you for the onslaught that is Manzanar Voices. Manzanar was, of course, one of the ten concentration camps in the U.S. during wartime and this is certainly an album of voices, without vocals. Uba, Miyagawa and Alexander return "Blues for John Okada" can be argued as the "Jazz farewell" on the record and from the title track onward, Horiuchi heads straight for the atonal, with amazing results. Poignant, pointed and violent, there are amazing textures on this record and his beliefs are in full flower, as always, recalling not only the war (the title cut), but also makes mention of the road ahead in "Stockton Calling," which has it's basis in an incident that happened contemporary to the album; five Southeast Asian children were shot to death in a schoolyard in California. Almost as if to calm the listener, the last track is a soothing, rather beautiful piano solo called "Lullaby." It is a jarring, spare record that invites great thought and repeated listening. At this point, Horiuchi was growing frustrated with the music scene in San Diego ("They want everyone to sound like Bill Evans," he told me once). It was hard to find work and to be fair, Jazz or Avant-Garde music isn't played or booked everywhere, so he and his family relocated to Glendale, just outside of Los Angeles. Calling Is It and Now is a transitional work, which was the debut of his new quartet, Francis Wong on Tenor Sax, Anders Swanson, bass and Jeanette Wrate's drumming. It is an unsettling blend of influences and at times, it almost seems that there is a battle to see which side wins. However, like a good episode of "The Honeymooners," sometimes (such as on "Precision"), the fights can be the best part! Charles Mingus mentions that when he and Eric Dolphy played, he didn't hear music, he heard conversation. At this point, the quartet are still feeling each other out, but it is a fascinating process. Also during this period, he had written the "Poston Sonata", which was commissioned for septet by the San Diego Community Foundation. It is an amazing work, which features cascades of piano and very little ensemble playing, each instrument taking his or her turn as the piece progresses. It even features some odd musical quotes, such as a snippet of "Come Sunday" by Duke Ellington and a discordant "As Time Goes By," perhaps to suggest at turns faith and the irony of Hollywood's depiction of the wartime effort. The move to Los Angeles and the advent of the Compact Disc seemed to have an effect on Horiuchi's writing. He no longer seems to be too concerned by any genre's limits and is not bound by the constraints of time, either; one of the cuts on his later albums is no less than twenty-one minutes! 1995 saw the release of Kenzo's Vision. Kenzo is his son and the title track was inspired his son's movement during sleep. By now, Horiuchi had taken up the Shamisen and had added the saxophone of Francis Wong and William Roper's tuba to the mix of music. While his politics are still prominent, musically, he has fused Jazz, Japanese forms and atonality and reaches for a language that all listeners can be conversant in. By this time, it seemed that music was pouring out of him. Within a recording career that lasted a decade, he released fifteen albums and was a guest or contributor to nine others! 1995 to1999 saw the release of EIGHT albums. One of the longest compositions he recorded was "Dew Drop", which was his contemplation on the beauty of a single drop of dew. What is his music like? Well, I thought he was a Jazz musician, originally. Yes, he is, but that would be limiting the scope of his art. His music reflects his Asian heritage, avant-garde influences and his political leanings. While some artists have written political songs, without taking any action (hello, Ian Hunter) or some have taken political stances and claimed that they were merely entertainers when challenged (how are you, Rush Limbaugh? ), Horiuchi has most certainly gotten involved, working with the Redress and Reparation movement (that would be the U.S. camps, not Germany's). So with regards to his politics, it may be said that he has not only composed, he has campaigned! The concert started out with "San Mi" (3 tones), which he played on the Shamisen, with the San-Mi Shamisen Ensemble. This group features a Shamisen virtuoso, Lilian Nakano, who, as he later said, got him interested in playing this instrument. The piece was well-played by the ten-person ensemble, even though Horiuchi himself said to the audience he was worried about throwing them off (!). Next was "Issei Spirit." This was a solo piano piece, played by Horiuchi in good old Ferrante & Teicher in other words, after sitting down to play, he immediately stood up and started plucking the strings! After that, he then began to play (perhaps attack would be a better word) the piano, alternating note clusters with chords, played notes and even shouted at the strings, reminding me of Stomu Yamashta. A fiery and disturbing piece. "Celebration," from his Poston Sonata (Poston was a concentration camp) featured Lilian Nakano on the Shamisen, Francis Wong and William Roper. While I am reasonably certain that this is one of the few pairings of Shamisen and Tuba, the problem of balance never intruded. The Shamisen (amplified) and the other two instruments played off of each other well. Roper coaxed many odd sonorities from his tuba, even knocking the side of it. "Oxnard Beet" (a solo piano piece dedicated to the 1903 sugar beet strike by Japanese and Mexican farmworker in Oxnard, CA) was played most energetically by Jon Jang. This was my favorite piece of the night (admittedly, the most Jazz-based). It is both melodic and percussive (the composition is based partially on taiko drum rhythms, according to one of his albums' liner notes). The last piece, "Dewdrop" was yet another pairing of Shamisen and tuba, featuring Horiuchi, Roper and Wong. This was a most challenging piece that went on rather long. Many sections of it were quite interesting and some, I must confess, were in a different musical language, which is good, as it keeps listeners on their toes, as it were. All in all, a fabulous program, including a Classical Japanese Dance (with vocals and Shamisen by Ms. Nakano). Quite literally, there was something for everyone. What would else you expect from a master musician who has played with Joseph Jarman and Wadada Leo Smith and released twelve albums under his own name, starting in 1988? According to the program, "His present project is his battle with colon cancer, which was diagnosed in August 1999." 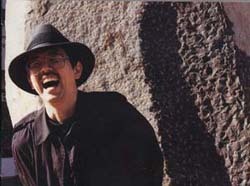 Glenn Horiuchi was in stage four of the disease, which is considered terminal, however, as he rightly pointed out during the concert, "We're ALL terminal!" This concert was not only a great evening of music; it was also a testament to this man's resolve, faith and humor, since it was doubtful that he was going to be able (well enough) to PLAY (he attended the reception afterwards, part of the time laying on his stretcher). His condition is sadly resonant for me since he is the same age as my brother (44) and suffering from the same disease that took my father from me in 1992. Glenn Horiuchi took all of it with inner strength and fortitude that humbled me. Had one not read the program, you would have heard a fellow explaining his music and his journeys, while laughing out loud at times. Referring to his rather hermetic dedication to his music, he explained "...I was politically active for some years, then I got into music full-time, HAHAHAHA! I used to have friends, HAHAHAHA!" Later, one would be surprised that the reason he stated for his being tired during the concert was due to his cancer. America has no great love of its composers, whether it be helping new ones or supporting current ones. Yes, there are programs of study and yes, we have more record companies than anyone else, however, compare this with Italy, who does no less than support music with government funds. Music is a part of the budget. Through all of this, Horiuchi composed great music and his great spirit persists.